It’s earnings season folks and Apple will post its results in less than a week. As we head towards the third quarter’s results from Cupertino, the rumor mill is active as usual. Apple’s expected to not only refresh the iconic iPhones as it always does but also introduce its new design, form, and feature upgrades to the iPad. Speaking about the iPhone, Apple will launch three new smartphones this year, tentatively dubbed as the iPhone 9, iPhone X(s), and iPhone X(s) Plus. Out of the trio, it’s the iPhone 9 that has received the lion’s share of attention from sources. Today, we’ve got another indirect mention of the smartphone that’s the part of a wider estimate of Apple’s expected performance in 2018’s third quarter. Take a look below for more details. Today we’ve got several analyst reports, the first one of which is from Morgan Stanley’s Kate Huberty. She’s been quite busy with Apple’s revenue projections and expected services to play a major role for Cupertino in the future, in a report published this March. Now, Huberty has concerned herself with Apple’s estimated results for the third quarter of 2018 and the potential impact of its upcoming iPhones on September’s results. 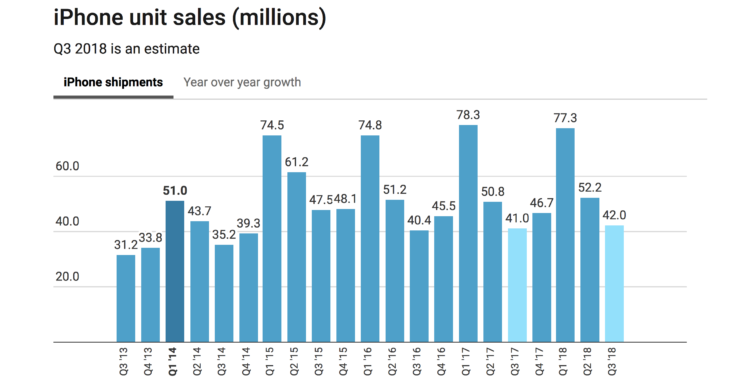 According to Huberty’s estimates, Apple will perform as it always does in the June quarter, with the analyst predicting slightly bullish performance. However, the September quarter for Cupertino, which will also witness the Fiscal Year 2018 results from Apple will be impacted due to weak performance from its supply chain. The Morgan Stanley analyst believes that performance for several of Apple’s suppliers is reflected one quarter ahead in the company’s balance sheets. Therefore, as a subset (12 out of 50-60) of Apple’s Taiwanese suppliers have reported weak June Y/Y performance, this impact will translate into Apple’s guidance for the September quarter. Additionally, the 2018 iPhone 9 with a 6.1″ LCD display is witnessing LED backlight leakages, which have delayed production by a month. Subsequently, Huberty expects that the smartphone will now release for sale in October, rather than September as was initially expected. In our second bit of iPhone coverage (third if you count the iPhone 9’s color option report from Jun Zhang), Wall Street is slightly optimistic for units shipped this quarter. Veteran Apple journalist Phillip Elmer-DeWitt is out with his collection of estimates and you can see the aggregate of his survey in the bar chart above. The second image represents a table showing his data points, where the blue highlights represent professional analysts. 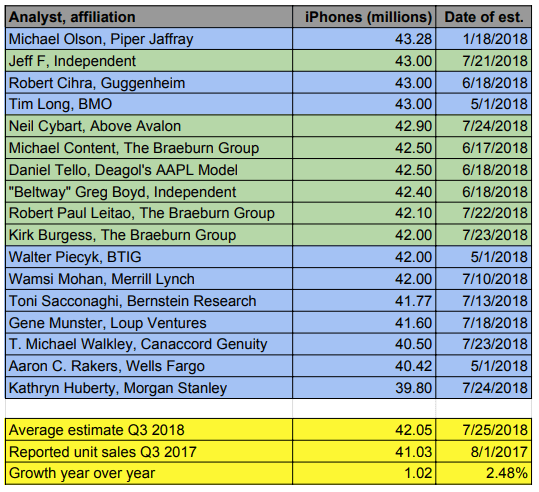 This data suggests that an average of all analyst expectations for the quarter’s iPhone shipments put the number ahead of Apple’s shipments in 2017. According to this data, Apple will ship around 42 million units of the smartphone this year, 1 million more than it did last year. Of course, Apple’s estimates for the fourth quarter will play an important role as well, since it generally witnesses an uptake in shipments. Finally, if Huberty’s belief that the iPhone 9 will witness a production delay then Apple might not be able to demonstrate the full power of its new iPhones on the balance sheets. Thoughts? Let us know what you think in the comments section below and stay tuned. We’ll keep you updated on the latest.